A porcupine is visiting the a neighborhood on Golf Course Road. He has a chunky body, small head, short legs and a stout tail. 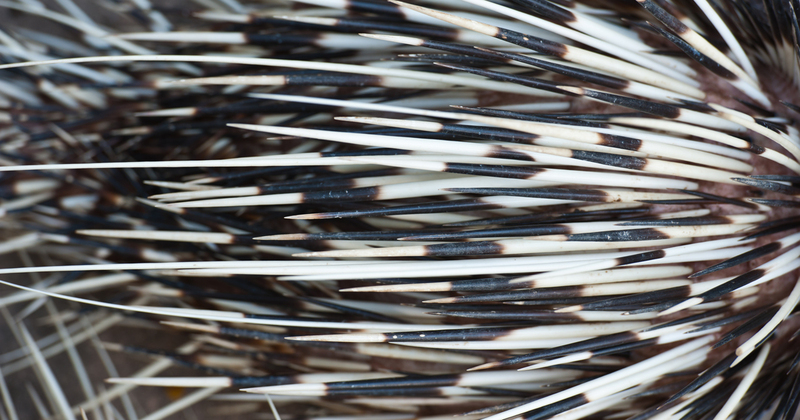 The upper parts of his body are covered with thick, sharp, barbed quills and many longer guard hairs. No one has attempted to check the statement in the mammal book that the fur under the quills is woolly and that his stomach is also woolly and without quills. The porcupine has made friends with the neighbor's cat and sleeps under the shrubbery with the cat. The owner's German Shepherd ignores the newcomer, fortunately. Porcupines are clumsy, slow moving creatures and are said never to attack. If cornered they erect their quills, turn their rump toward the source of danger and rapidly swing their barbed tail at the attacker. Porcupines do not throw or shoot their quills, but the quills are so loosely attached that they easily break off in the skin of the enemy. The quills may also become detached if the porcupine rolls on the ground and if the animal shakes itself after rolling, a shower of quills results. Porcupines normally live in wooded or forested areas and their chief winter food is the inner bark and needles of evergreen trees. In the summer they eat twigs and leaves of deciduous trees and shrubs as well as many wildflowers. The naturalist Vernon Bailey once had a tame porcu¬pine that ate mesquite beans, Ephedra (Mormon tea) and saltbush in addition to sweet potatoes and apples. Porcupines are pests near camps as they gnaw anything which contains salt, such as ax handles, saddles, boots or other objects saturated with the salt from perspiration. In spite of their slow movements, porcupines are great gypsies. Our Midland porcupine must be a champion wanderer, for he (or she) is far from any wooded area. They are nocturnal animals and do their traveling at night. They are expert tree climbers and often spend the day sleeping in a fork of a tree. They seem to have an excellent sense of balance and can walk along a tree limb as well as a monkey. Coyotes and mountain lions often kill porcupines, but their heads and legs suffer the consequences. There is one published report of a mountain lion that died as a result of seventeen imbedded porcupine quills. Some quills had penetrated its eyes and brain. Coyotes outwit porcupines by working in pairs and maneuvering the porcupine onto its back so the vulnerable parts are exposed. The porcupine's greatest natural enemy is the fisher. These animals belong to the weasel family and are about the size of large housecats. The fisher is so agile that it is able to out-maneuver the porcupine and attack its soft underbelly. Wherever porcu¬pines become so numerous that they damage valuable forests, state forestry departments import and release fishers to eradicate the porcupines. Ted Jones has frequently commented upon the fact that the bark is stripped from mesquite trees in the draw much higher than a pack rat would be expected to work. Could it be that porcupines have invaded Midland and Mustang Draws and that their winter food consists of mesquite bark?